Chop Chocolate and place into a heatproof bowl with half of the cream. Stir over simmering water until smooth and melted. Remove from Heat, add egg yolks and stir until combined. Beat remaining cream in a small bowl until soft peaks form. Beat egg whites using an electric beater, until soft peaks form. Add sugar, 1 tbs at a time, beating well after each addition until thick and glossy. Add a spoonful of egg white to chocolate mixture and stir through. Gently fold in remain egg white and cream. Chill for 40 minutes until thickened. 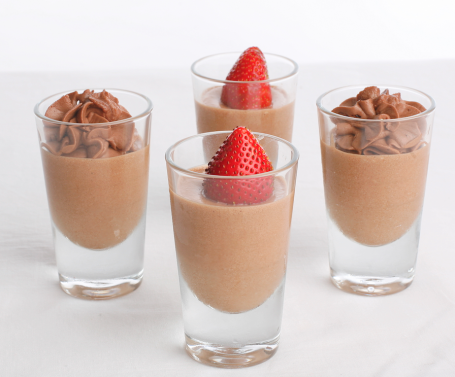 Pipe or spoon mousse into shot glasses. Chill overnight.